Author: Scott Houston, David Jess, Samuel Grant, Krishna Prasad (Queen’s University Belfast) Andrés Asensio Ramos (IAC), Christian Beck (NSO), Aimee Norton (Stanford). Studies of the dynamic, oscillatory behaviour of magnetic fields in the solar atmosphere are in their relative infancy, with previous analyses focusing on strong photospheric magnetism. The chromosphere adds a layer of complexity to the energy embedded within the magnetic fields, including omnipresent dissipation, which has implications for thermal connectivity to the corona. The introduction of advanced observational instrumentation, in conjunction with newly developed inversion techniques, has enabled studies of the interaction of non-linear shock fronts in sunspot umbrae (umbral flashes) with the local umbral magnetic field . Chromospheric observations of sunspot umbrae offer an exceptional view of magneto-acoustic shock phenomena and their impact on the surrounding plasma. Umbral flashes (UFs) are ideal candidates to study magnetic field fluctuations in the chromosphere, since they are energetic, highly non-linear, occupy a large area in the umbra and display well-defined properties. UFs exhibit a periodicity of approximately 3 minutes, which is a consequence of their origin in upwardly propagating magneto-acoustic p-mode waves traversing the density stratification of the lower solar atmosphere, subsequently forming shocks. In this nugget, we present the results from the first large-scale statistical study of vector magnetic field perturbations, arising from UFs in the chromospheric umbra of a sunspot. We employ the HAZEL  inversion code to provide insights into the dynamic fluctuations of both longitudinal and transverse components of the vector magnetic field resulting from shock front interactions. Figure 1. Top Left: ROSA 4170Å continuum image of active region NOAA 12565. Middle Left: IBIS blue-wing snapshot acquired at 8540.82Å (linecore−1.3Å). BottomLeft:IBIS Ca II 8542Å line-core image, where the green contour represents the location of the outer umbral boundary. In each panel, the solid red line represents the orientation and position of the FIRS spectral slit. Right Panel: Velocity–time image showing the spectral and temporal evolution of the He I 10830Å Stokes I line profile, where the black-to-white colour scale represents the inverse spectral intensities to aid visual clarity. The vertical dashed red line represents the rest position of the He I 10830Å line core. Using the Dunn Solar Telescope, we acquired high cadence images (ROSA), diffraction limited precision spectro-polarimetry of the chromospheric He I 10830Å line (FIRS) and simultaneous spectroscopic imaging of the Ca II 8542Å absorption profile (IBIS) in the leading spot of NOAA 12565. 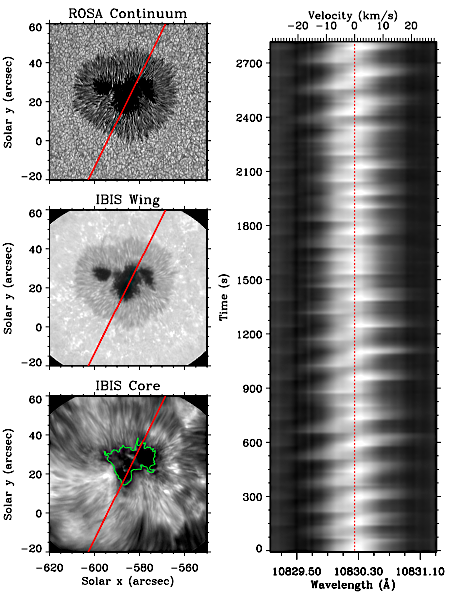 Calibrated and co-aligned images in ROSA 4170Å continuum, IBIS Ca II 8542Å blue-wing and IBIS Ca II 8542Å line-core, displayed in Figure 1, span the low photosphere into the high chromosphere. The location of the FIRS slit is contoured over the umbral centre. The high temporal and spectral resolution of IBIS allowed for the identification of 298,091 individual umbral flash pixels in the sunspot umbra. These detected IBIS UFs were co-registered in time and position with FIRS, resulting in 12,988 individual spectro-polarimetric flash spectra. 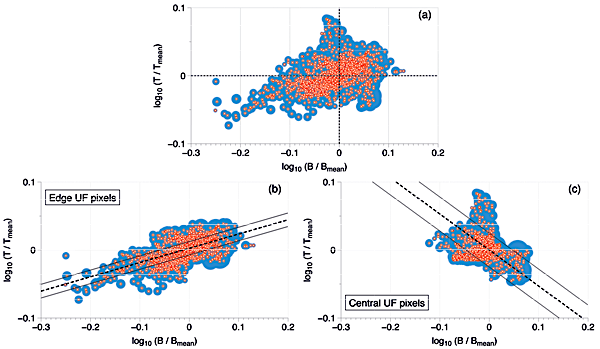 The right panel of Figure 1 displays the characteristic ‘sawtooth’ pattern of an UF in velocity space, indicating that UF signatures are prevalent in the high chromospheric signals captured by the FIRS spectra. Use the HAZEL code to invert the He I 10830Å Stokes profiles, we investigated the effects of UFs on the local environment, deriving the magnetic field strength, the inclination and azimuth of the magnetic field vector, the Doppler velocity of the plasma and the thermal (velocity) broadening of the sampled plasma. Fluctuations in temperature and magnetic field strength (Figure 2) suggest two distinct populations in our data, related to the filling factor of the shocked plasma in each FIRS pixel. These populations are isolated and displayed in the bottom panels of Figure 2. The first population is classified as ‘edge’ pixels, which have a non-flashing pixel in one or both neighbouring pixels. Pixels in the second, identified as ‘central’ pixels, are bounded by positive UF identifications on both sides. Figure 2. Scatter diagrams of the total magnetic field strengths and temperatures induced by UFs, each normalised by their respective pixel means (red circles). The shaded blue regions represent the associated errors for each of the data points. Panel (a) represents all detected UFs, with the dashed black lines highlighting the origin location. Panel (b) displays only edge identified UF pixels, while panel (c) depicts centrally defined UF pixels. A linear line of best fit is plotted using a dashed black line, while the dotted black lines represent the 1σ error boundaries associated with the fitted line. Edge pixels exhibit a positive correlation between temperature and magnetic field fluctuations. The embedded flux tube scenario can be used to explain this outcome, where initially a flux tube only partially fills an edge pixel. The non-linear shock then provides increased pressure, causing expansion of the flux tube, filling more of the pixel with greater magnetism, while at the same time increasing localised plasma temperatures. The linear relationship can be explained through thermodynamic considerations in an atmosphere dominated by magnetic pressure, leading to an estimate of the sunspot’s chromospheric adiabatic index of γ=1.12 ±0.01. The second population (pixels filled entirely with shocked plasma) shows an anti-correlation between temperature and magnetic field strength. A decrease in field strength, simultaneous with an increase in temperature, is consistent with previous studies , and is also consistent with the viewpoint of shock formation in the lower atmosphere . By inverting Stokes Q and U spectra we performed the first examination of the transverse components of the magnetic fields during UF events. The right panel of Figure 3 displays the results of the synthesis, with Bx and By denoting the magnetic field components in the solar east-west and north-south directions respectively. The strongest magnetic fields (B > 1600G) are associated with the largest magnitude transverse fluctuations, and are preferentially orientated along the north-north-west to south-south-east direction. However, the weaker fields (B < 1600G) are orientated along the east-north-east to west-south-west direction. Figure 3. Left Panel: An HMI photospheric vector magnetogram, over-plotted with vector representations of the extrapolated chromospheric magnetic field. The colour scale corresponds to the absolute magnetic field strength of the depicted vectors, while the lengths of the lines relate to the magnitude of the transverse magnetic field. The white line represents the position of the FIRS slit across the centre of the umbra. Right Panel: Vectorised representations of the changes in Bx and By obtained from UF pixels within the umbral region of the FIRS slit displayed in the top right panel. The colour scale represents the absolute magnetic field strength for each arrow. The black dashed and dash-dotted lines highlight the lines of best fit for total magnetic fields exceeding and less-than-or-equal-to 1600 G, respectively. For each line of best fit, the dotted black lines represent the associated 1σ uncertainties. To investigate these preferential directions, we employed a NLFFF extrapolation code  to examine the widespread, at-rest geometry of the magnetic field in the sunspot chromosphere. The resulting vector diagram is displayed on the left panel of Figure 3, with the white line representing the location of the FIRS slit. It is important to note that the left panel of Figure 3 depicts the ‘at rest’ quiescent geometry of the magnetic field, while the right panel of Figure 3 reveals the dynamic fluctuations as a result of UF shock phenomena. It can be clearly seen that the strongest magnetic fields (B > 1600G), which are normally orientated in the north-north-west to south-south-east direction, experience transverse perturbations along the same direction following shock formation. Similarly, weaker magnetic fields (B < 1600G) that are preferentially orientated east-north-east to west-south-west, also demonstrate preferential perturbations along their quiescent directions. Such perturbations may be explained by a number of scenarios: (1) changes in the inclination angles of the vector magnetic field, (2) increases in the measured magnetic field strength caused by the physical adiabatic expansion of the magnetic flux tube through those pixels, (3) reduced magnetic tension in the locations of weaker magnetic fields, thus promoting more susceptibility to field perturbations, or (4) a combination of all three. Using a large set (93,991) of He I 10830Å Stokes profiles, we provide the first comprehensive investigation of the modification of the 3-D chromospheric magnetic field due to non-linear wave front propagation in sunspot umbrae. Our study shows that derived magnetic field and plasma properties are dependent on the pixel filling factor of energetic, shocked plasma, with edges of UFs providing a misleading positive correlation between temperature and magnetic field. It is only the central pixels of UFs that exhibit the expected anti-correlation between the magnetic field strength and temperature perturbations. With this in mind, the fluctuations in the transverse components of the magnetic field (Bx and By) resulting from UF phenomena were observed for the first time, along with four possible scenarios to explain such perturbations. Deciding which scenario is most plausible is a challenging task, demanding even greater temporal resolution and spectral sensitivity to observe the complete morphology of UFs. Upcoming facilities such as DKIST and EST, allied with an ever-improving suite of inversion routines, will provide an unprecedented insight into the evolving nature of chromospheric magnetism.